I have been so busy I havn't had time for too much. However, I did find some pretty Mums and so I thought it was time to do a little bit of something to spruce up the front porch. It is still in the 100's here, so no pretty flowers, however a few faux ones will have so do in the meantime. At least from the street it looks a little more like fall. 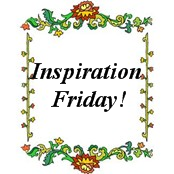 I am linking to Inspiration Friday @ Southern In My Heart. Be sure to go visit her and see all the wonderful things that everyone has created to inspire you. Marty, your porch looks very fall-like. Very nice. Your new haircut inspired me and I got mine all cut off this afternoon. It feels SO MUCH BETTER! I like the new picture! It doesn't even feel like fall here in Illinois, it is in the 90's this week! Your porch is perfect for decorating...I wish mine had more space. Looks very pretty. What is that growing in your flowerbed? This is certainly inspiring! I need to clean the front porch now. I love your fall color on the porch, especially the flowers in between the rockers. It looks great! Love the porch -- your porch always looks so tidy and pulled-together, so pretty. Mine always has leaves and spider webs on it! Thanks ... your porch can now inspire ME. OH I forgot to say -- you look SMASHING in your makeover pictures. I love the hair, the makeup -- you look absolutely wonderful and I would never, ever guess you were 70. Not ever. I think you look younger than in the last profile pic! You are a stunning woman, and a very sweet one, too . . . and we bloggers just love you! Sorry not to have been by in a while. 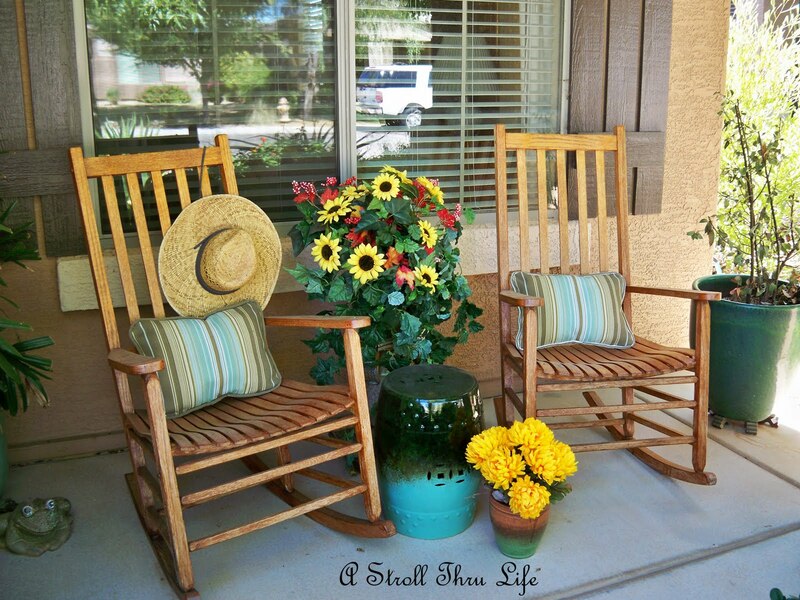 I love your use of the sunflowers to brighten your porch...I think they brighten life where ever they go. A bit like you, I'd say. P.S. Love your new photo...you look gorgeous! Marty it is still in the nineties here, but cooling down this weekend. I am ready for my cooler season flowers, too. Your porch looks great. 100's yuck! I understand flowers and the heat! My new wreath I just made and hung on my door started to melt in the heat. The hot glue I used to adhere the leaves and ghost softened up enough for the items so start slipping and hanging in odd ways. lol I have had to wire everything to the wreath! You have such a pretty, organized and well manicured porch! I love all the fall touches. I am a huge fan of gorgeous wreaths, and your's is just that! I could wile away the hours on one of your rocking chairs... if only it wasn't 100 degrees! oh I'm so glad it's cooler here now. Although I live in Canada, it still reaches over 100 on a regular basis during the summer. I do think it cools down a lot sooner though =) Your porch is beautiful. 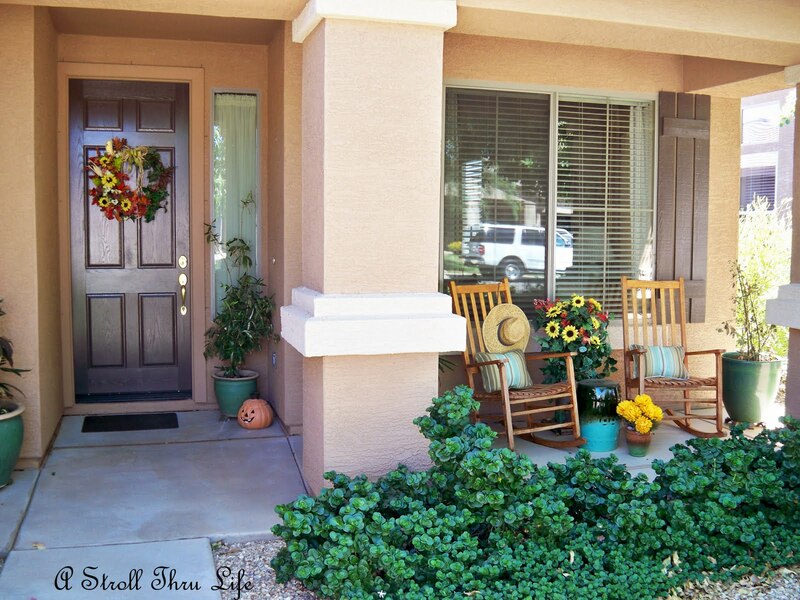 I am looking forward to repainting my front door and sprucing up my porch, just in time for fall and Halloween! Beautiful Fall changes to your porch, Marty. It may still be 100 degrees but your porch definitely says fall is here! I bet just looking at it makes you feel cooler. Marty, I Love the addition of Fall to your porch! It's suppose to be the 70s in Virginia this weekend so I am pulling out my Fall decor. I'm liking those rockers! Your fall decor is just the right touch! It looks so pretty and inviting! :) I'd love to come sit and visit with you! Marty, your porch is just wonderful. I know you wish it would cool enough to enjoy it! I like your idea of using silks -- I'm here in the hot, humid, south! Marty, this is so pretty! I love your wreath and the mums! It is still in the upper 90's here too and I am so tired of HOT!! Your porch is beautiful! I love those rockers! Happy Fall! Oh how fabulous is your new look ! Marty you simply put the inspire part into inspiration . Thank you for your gracious hospitality . I have had a wonderful time getting caught up with your blog . I do hope to have more time for visiting when the days get a little shorter. Big Texas hugs to you sweetie . ps - Of course I remember "I Just Called To Say I Love You"!!! Nice, Marty. I know what you mean - the Christmas decor is already crowding out the fall stuff and it's still in the 90s here. Oh, and I like your new photo. your porch is so beautiful...and so inviting...Wish I could stop by for a visit...and a cup of coffee..Have a great weekend. And your porch screams let the fall leave start to fall!! Love it all! !I want a pair of rockers for my almost to be made front porch!! Things are looking great! I like your wreath, fall arrangement on your table, and your cute pumpkin. It must be hard to decorate for fall when it is 100 degrees. It's been in the 90's here and I think we are all ready for cooler temperatures. Marty, I love your porch for fall! I also love that urn by the rocker and remember when you did it. It was inspiring to me! Hi gorgeous Marty! Your front porch is just so charming, I love your sweet little touches, that hat is adorable hanging on the chair. You front porch is stylin'! Hi Marty! Makes me want to sit and visit for a spell. I really love the big sunflower arrangement between the two rockers. Very nice! Thanks for sharing. Your porch is so inviting. I just want to plop down on one of those rockers and grab a glass of lemonade. Love the touch of sunflowers. Gorgeous wreath! Your porch looks ready for fall. I know I'm ready but the temps just don't want to cooperate. I don't ever remember such a hot September! Your front porch is so welcoming and festive. The pillows in your rocking chairs are a nice touch. I love how you're made your porch so cozy. I'll bet it really stands out in your neighborhood. Thanks so much for sharing, it's giving me ideas........hmm. Marty, I know you may not accept blogging awards, but I have passed the Beautiful Blogger award on to you. I have linked to the specific post. What a welcoming front porch! I'll be over for some coffee and to lounge in the chairs!!! Even your porch oozes grace. How do you do it?